— FULCANELLI, Le Mystère des Cathédrales, 1926. The Parisian alchemical revival of the 1920s gave rise to a vibrant esoteric view whose roots extend deep into Medieval history: the Gothic cathedrals of Europe, but particularly those of France, were Hermetic scriptures in stone. Cathedrals such Notre-Dame and Chartres exemplified a profound Hermetic philosophy codified in the language of Christian symbolism. They were not only masterworks of European religious architecture, they concealed and revealed the mysteries of the Great Work. But there is more. The art of the Cathedrals was a living example of the techniques of the alchemists themselves. At least, this is the claim of practicing Hermeticists of the early twentieth century, such as Fulcanelli, Pierre Dujols, and René Schwaller de Lubicz, who worked to recreate the unique blues and reds of the earliest stained glass windows. Without going too much into the details of the theory, these alchemical techniques sought to extract the coloured “soul” of metals from their “bodies” in order to instil them in a body of molten glass. It is important to emphasise that this was not merely a process of colouring glass via metallic oxides, which is how glass is ordinarily stained; rather, it was a demonstration of the existence of the “spirit” of metals, and thus a true form of the philosopher’s stone. Through this, the red spirit of gold and the blue spirit of silver would be forever embodied in visible form, shining as living talismans of solar and lunar Gnosis. 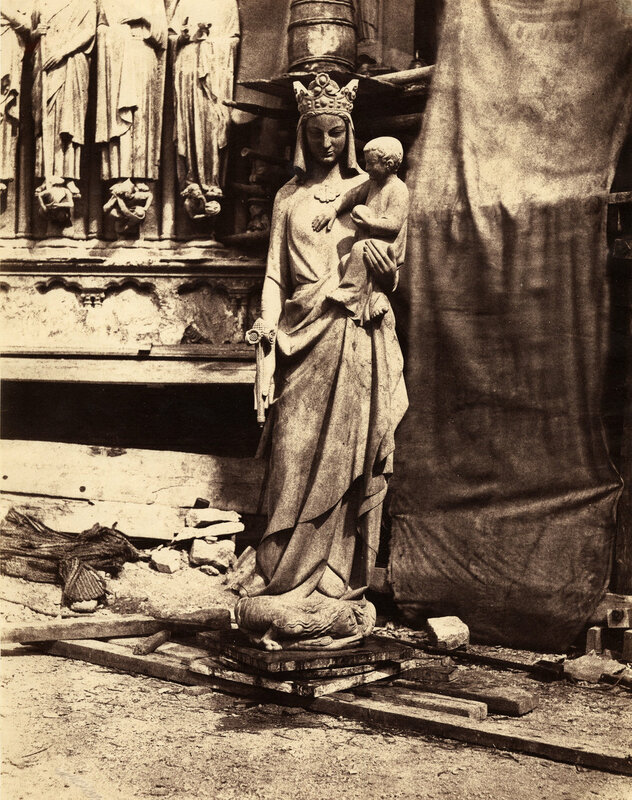 The image depicted here is a photo of Auguste Mestral’s sculpture, “Virgin and Child” (Notre-Dame, Paris, 1853–1854), which under the direction of Viollet le Duc, formed part of the reconstruction efforts following the deliberate damage to the Cathedral during the French Revolution. In the wake of the devastating fire that has torn through the Cathedral today, I place it here to demonstrate that Our Lady’s images and temples—and more importantly her Wisdom—will always be regenerated from their ashes. Despite the exigencies of generation and corruption to which our world is subject, the Divine Mother is ever-present. And she will always breathe new life into those who desire to be born into eternity.